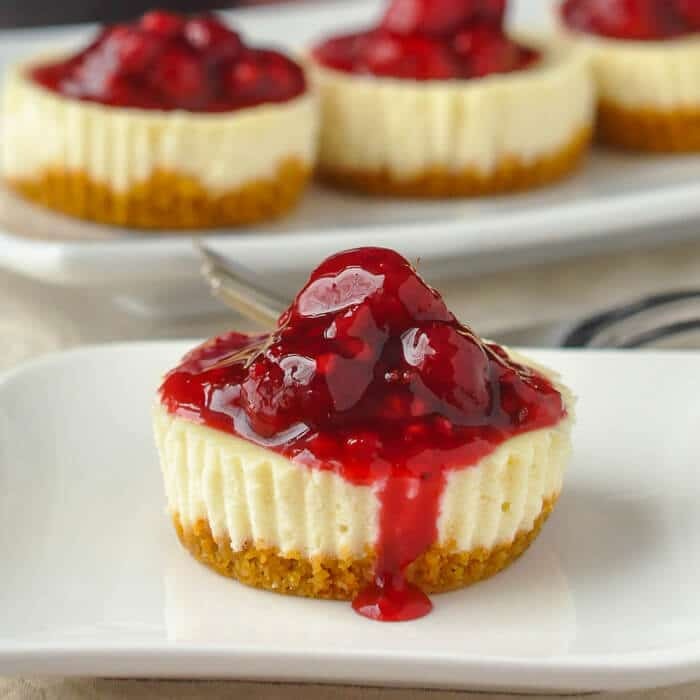 Mini Lemon Cheesecakes with Raspberry Sauce. At only 200 calories each, this recipe yields 12 perfect little portions of cheesecake to let you indulge without a huge calorie binge. These mini lemon cheesecakes with raspberry sauce are just the thing to serve as the finale to this week’s Valentine’s Day Dinner menu. The combination of tart lemon its bright, sweet raspberries is one of my favourite flavour marriages; I love it as much as I do lemon and blueberry. These mini lemon cheesecakes are the latest in a small selection of mini cheesecakes that have appeared on this site including Chocolate Cheesecake Cupcakes and Raspberry Tuxedo Mini Cheesecakes. I love this idea of making what amounts to about 1/3 of a whole, full-sized cheesecake because the real temptation with making a large dessert like that, is the leftovers. A single small slice at a family dinner is fine but unless you’re having a huge gathering, the rest is going in the fridge to tempt you for days. Even if there are a few stragglers leftover after Valentine’s Day, treat yourself and your sweetheart to one, guilt-free, every day until they are gone. You can also pop them into the freezer for another occasion if you prefer. They freeze beautifully for a few weeks in an airtight container. Like this Mini Lemon Cheesecakes recipe? 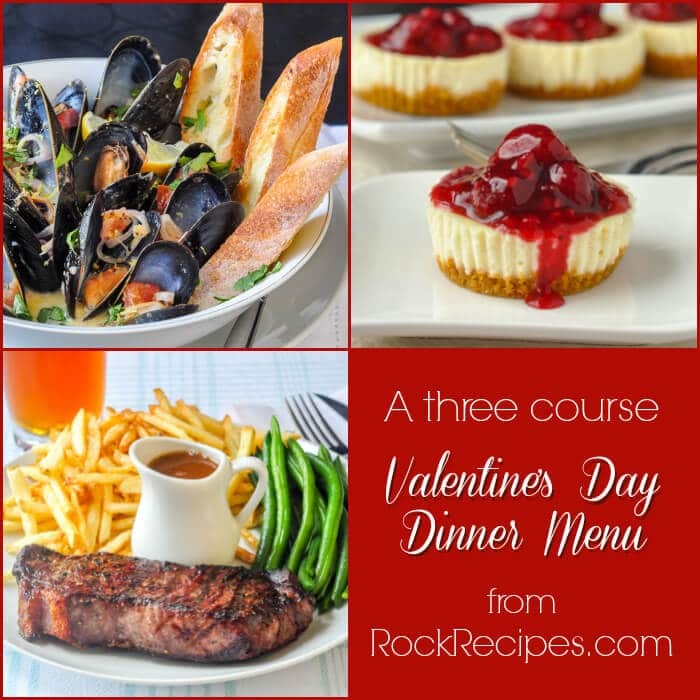 Find plenty of other delicious ideas for you and you sweetheart in our Valentine’s Day Recipes Category and even more in our Desserts Category. 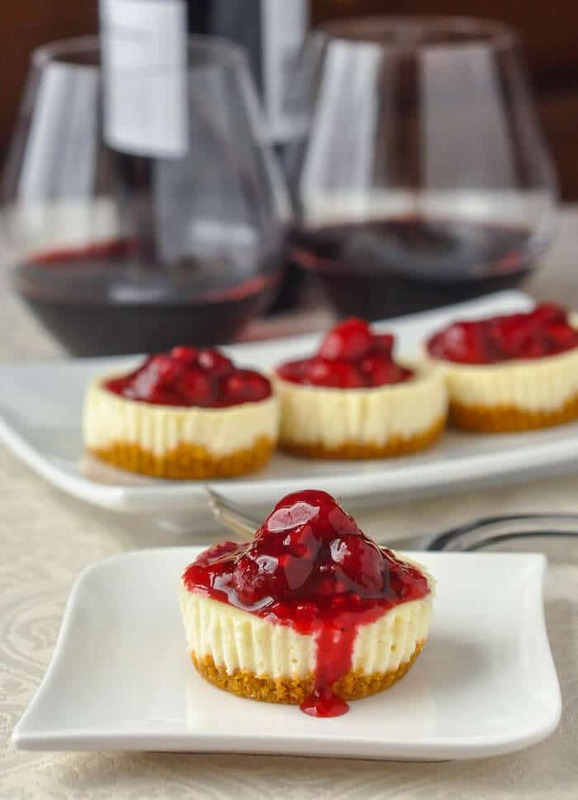 Mini Lemon Cheesecakes with Raspberry Sauce - this recipe yields 12 perfect little portions of cheesecake to let you indulge without a huge calorie binge....even if you sneak a second one! ⅓ cup whipping cream unwhipped, straight from the carton. Beat the cream cheese, lemon zest, sugar and vanilla extract until smooth. Serve with the raspberry sauce. To your smallest saucepan add the raspberries sugar and 3 tbsp water. You want to simmer this gently for about 10 minutes, using a rubber spatula to stir. A very gentle hand is needed here both with the simmering and the stirring so that the raspberries do not break down. Dissolve the corn starch in only enough water to get it to a liquid state. Pour into the simmering raspberries, stirring gently until the mixture is thickened, about another minute. Remove from the heat and allow the sauce to cool to room temperature. I made these as our Easter dessert today, they were amazing! I did a double batch so everyone got to take a couple home. Could I substitute sour cream instead of whipping cream for the mini cheesecakes ? As long as it’s full fat, it should be fine. These are delicious and sooooo cute!!! I made them and three of us ate them all.